Pu Luong is a nature reserve belonging to Ba Thuoc district, Thanh Hoa province, 3,5 hour drive from Hanoi.It is a new travel routes for tourists who love natural beauty ,adventure activities such as trekking, rafting or homestaying in local homes of Thai or Muong ethnics.You can extend your trip to Pu Luong nature reserve when you are on your vacations to Mai Chau valleys or you can travel directly from Hanoi in 2-4 day Pu Luong Trekking Tour. Touring to this nature reserve, you can visit many tribal villages such as Don village , Kho Muong village, Am village….However, it will be a big miss if you do not spend time exploring Ban Hieu (Hieu hamlet). 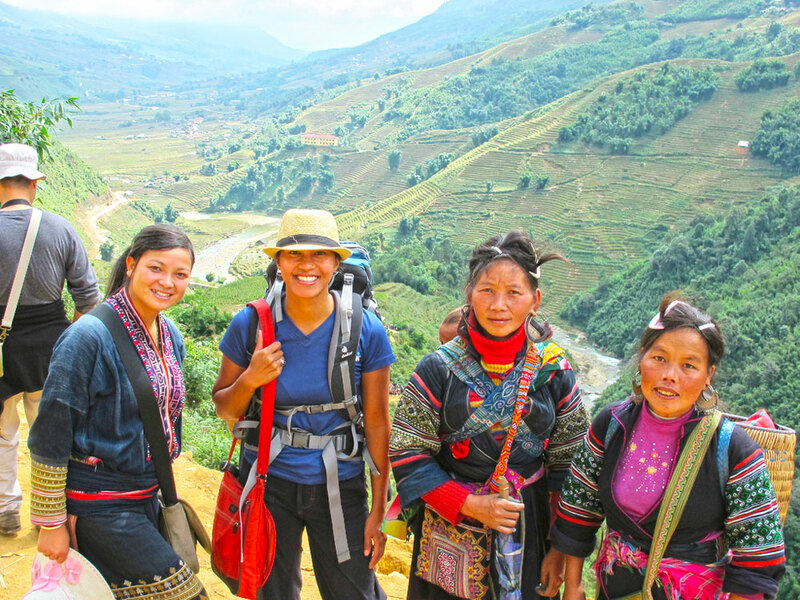 Ban Hieu ( Hieu Village)- a beautiful stop for trekking and homestaying. Ban Hieu is a remote and off- the-beaten- track village in Pu Luong nature reserve. 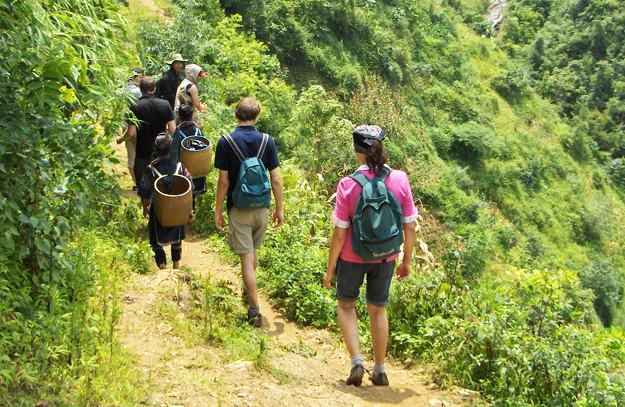 Trekking to and homestaying in Hieu Village are activities that you must do to visit this beautifully rural village. 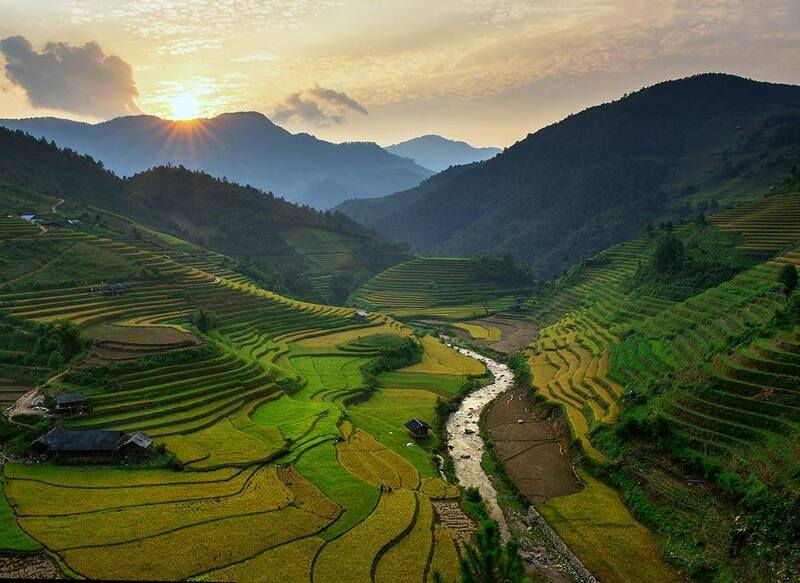 You will experience most people’s image of an idyllic Vietnamese landscape and rural life. Lying in the steep slopes of jagged mountains, Hieu village overviews stunning valleys with its natural waterfall running day & night;and ever-green terraced fields extending from thickly forested slopes to water edge of muddy river. Dotted in that beautiful landscape are small settlements of wooden houses on stilts where local BlackThai ethnics live from generations to generations. Women in conical hats do their farms on terraced fields, men tend buffaloes and goats along the fields, and children play in earthy courtyards or take turns jumping from bamboo bridges into rivers. It appears to us (visitors) a scenic spot where nature is entirely benevolent; a land so fertile that it sustains each household throughout the year. 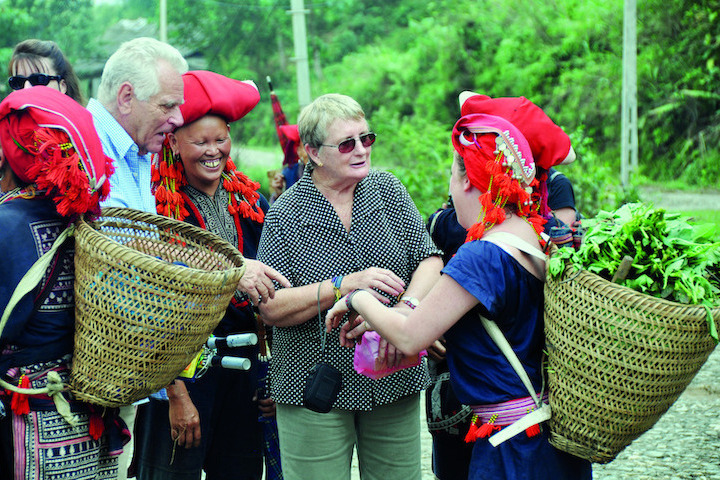 Hieu hamlet is located in Pu Luong Nature Reserve, 170km from Hanoi, 60km from Mai Chau.The most comfortable & convenient way is joining us in a private Pu Luong Trekking Tour package to Hieu Village with a local guide from Hanoi or from Mai Chau.You are just relaxed with the natural beauty of this region instead of thinking yourselves of any service arrangement.We have alrealdy designed interesting intinerary, service inspection to make sure of your lifetime experience & enjoyable trip. If you would like to do it by your own way, you can rent a private car with driver & a local guide to show you around the reserve with us.Here is the detailed guidance of how to get to Hieu hamlet in Pu Luong Nature Reserve.From Hanoi, we will follow highway 06, then take turn to Ho Chi Minh highway till Cam Thuy town (Thanh Hoa Province), make a turn on the right to 217 national road to Canh Nang town,then turn right to road 15C about 10km, then ask directions to Pho Doan about 4km away.You can easy to realize Pho Doan as it is one of the only villages in the nature reserve that consists mainly of concrete buildings, rather than wooden stilt houses. The road to Hieu village is to the right, just after Pho Doan. We will start 7 km motobiking or trekking to Hieu village because the car can not reach.The road quickly changes: going from dirt track, to trail and to narrow pathway. This route is more suited to trekkers than riders, but locals drive their motorbikes up and down the mountain paths and, in dry weather, there’s no reason why you can’t too. However, it’s advisable to take note of current weather conditions; heavy rains will make the steep, muddy paths almost impossible to drive up and down by motobikes but slow trekking in a slippery trails. 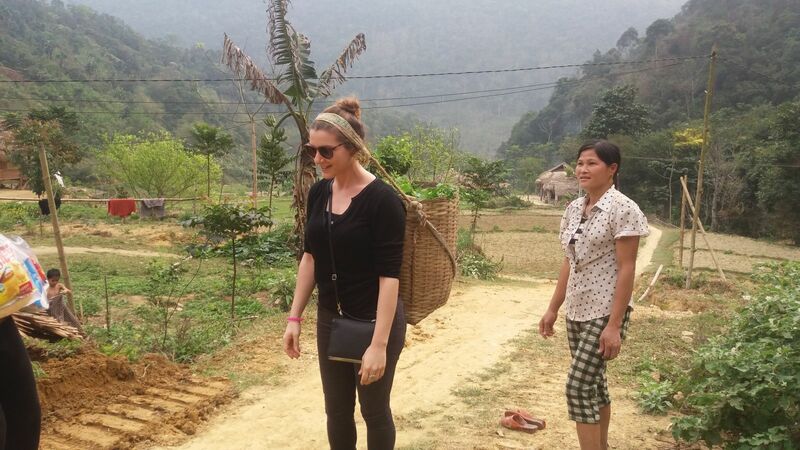 What an interesting adventure trekking to Hieu village it could be to your imagination ! Trekking routes will take you 3 hours and travel though Doc village, Lac village and then to Thac Hieu (Hieu Waterfall) in Hieu Village (Ban Hieu) with wonderful view of valleys and mountains and get to know locals’s daily lives.Because Hieu Village is a remote one,not yet with tourist influence, there are no shops or restaurants nearby.You should bring along some snack food along with you to keep you going between mealtimes. Hieu village is a nice spot for spend your night in.Homestays and accomodations are new services and not much for your choice here comparing with big cities. For a good service but high cost, you can stay in Mr Si’s resort with private bangalows.For authentic feeling of local cutures & low cost, you can choose homestaying in Mr Ba’s house on stilts with simple mattress and mosquito net spreading on floor for night,eating local lunches or dinners cooked by his wife.You can together cook with his wife for your wonderful meals. Relax with beautiful view of valleys & mountains, observe the daily routine of Thai ethnics in a rustic, rural village, could be a reason to attract your interest.The livestock, herb and vegetable gardens, tropical fruit trees, food preparation and cooking over an open flame, and the irrigation systems that channel water from mountain streams, through bamboo pipes, and into the wet rice fields, is all fascinating to witness, especially if you come from a big city.Besides,you can join some good treks to discover the nature reserve’s diveristy or to visit some villages neaby. If you are interested in travelling to Hieu village, Pu Luong Nature Reserve or any other Vietnam destinations, don't hesitate to email us at mucangchaitravel@gmail.com or visit our website http://mucangchaitravel.com for Pu Luong Nature Reserve Tours of your interest. We have designed vietnam adventure tours to suit your requirements.See you in Hieu village, Pu Luong nature reserve, Vietnam ! 08 am: our tour guide and driver pick you up at your hotel and depart for Mai Hich passing through beautiful mountainous landscape. Mai Hich is a small village, located about 150km from Hanoi, around 13km from the center of Mai Chau province, in which most of people belong to the White Thai ethnic minority community. It is located in very beautiful and untouched mountainous landscape surrounded by jungle. 11.30 am: Arrive in Mai Hich, have a lunch in a stilt house. 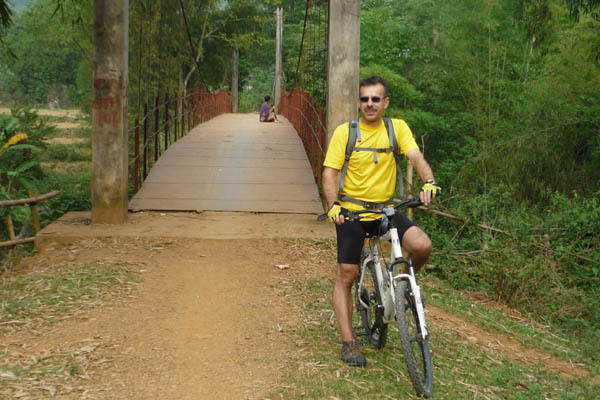 In the afternoon, walk or cycle around the villages to enjoy the beauty of the surrounding nature and rural activities in action, including houses-on-stilt, fish ponds, low terrace paddy fields, and so on. 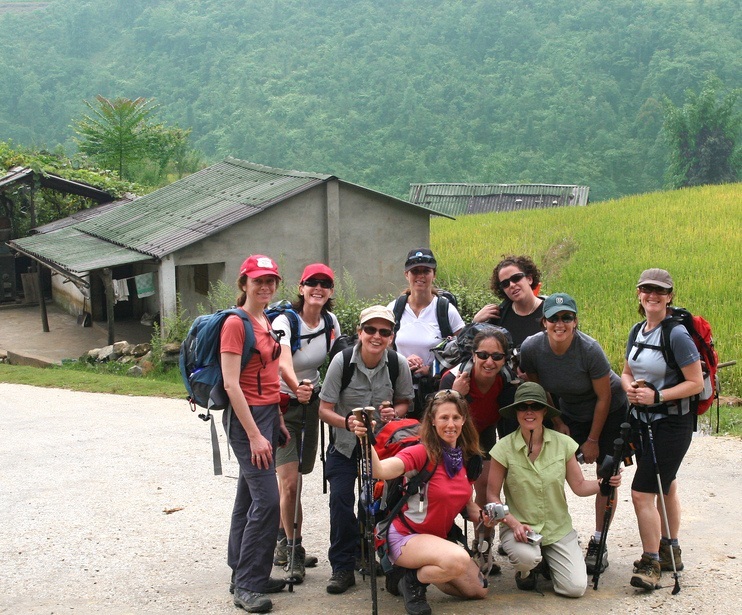 After that, you’ll set off on a short hike to a jetty on the Xia River. You’ll board a traditional raft, just like the locals use and slowly meander down stream. In the evening, enjoy a local traditional dinner. Have a comfortable overnight rest at homestay. We leave our hosts after breakfast and drive East for about 25 km before entering the Pu Luong nature reserve. 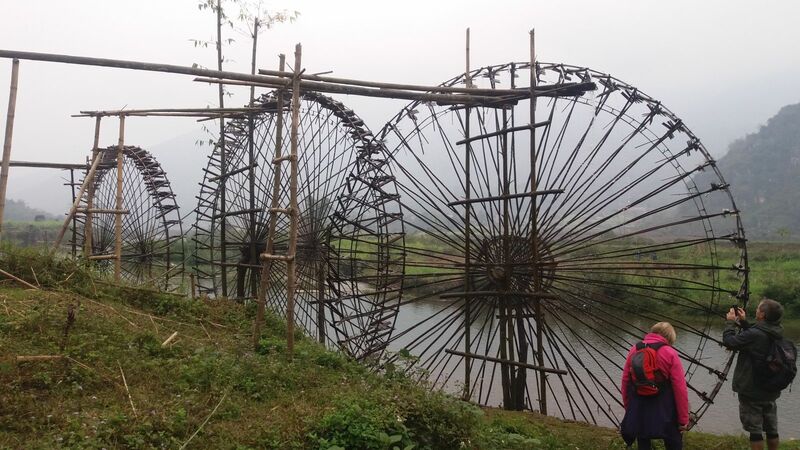 Start trekking from Hieu village, you have an excellent opportunity to stroll around the village to learn more about the daily local life and see Hieu waterfall, magnificent rice paddies, seeing hand crafted bamboo water wheels. Arrive at homestay, drop your luggage at the homestay and enjoy the lunch. In the afternoon, we will trek to Don village. Along the way we pass through several Thai villages and hamlets before arriving at the village of Ban Don. 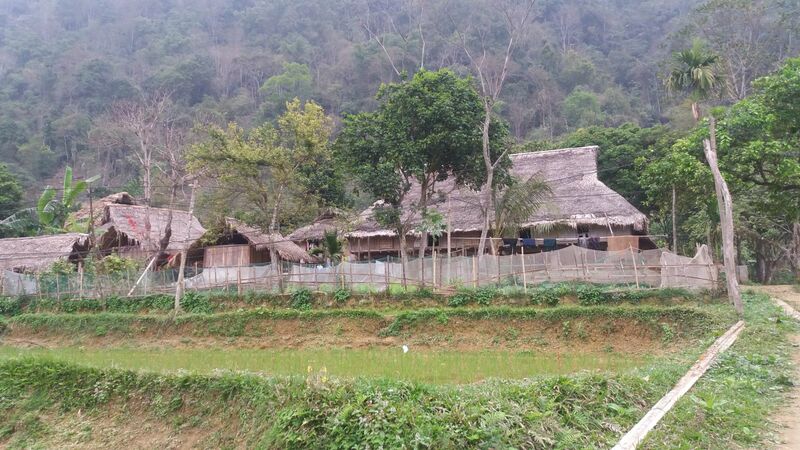 As the name suggests this is a Muong minority village. Transfer by car to homestay at Bang village to enjoy your meal and overnight in the stilt house with our friendly Thai hosts. After breakfast, you spend a little time strolling around to see daily activities of the local people in Bang village. And a short trek around 1 km to see beautiful rice terrace fields with very large rock for taking pictures. Have a lunch in Bang village. After lunch and relax, you come back to Hanoi. The car will drop you off at your hotel. The tour ends and see you next trip.